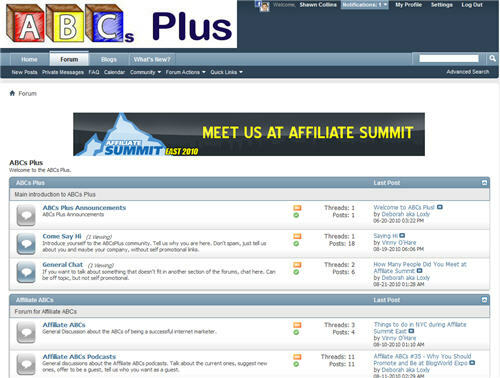 There is a growing affiliate marketing community at a forum called ABC’s Plus, which is run by affiliate marketer Deb Carney. Deb has been recording a podcast for nearly two years with Vinny O’Hare called Affiliate ABC’s that is rich in the basics of affiliate marketing. In the same spirit, the ABC’s Plus forum provides an atmosphere for affiliate marketers to learn able the many facets of online marketing from Deb, Vinny, and a host of other folks. Visit the discussion forum at http://abcsplus.com/forum.php.